Richard B. Bernstein, Are We to Be a Nation? The Making of the Constitution (Cambridge, Mass. : Harvard University Press, 1987). R. B. Bernstein, The Founding Fathers Reconsidered (New York: Oxford University Press, 2009). Richard D. Brown. "The Founding Fathers of 1776 and 1787: A Collective View," William and Mary Quarterly, 3rd Ser., Vol. 33, No. 3 (Jul., 1976), pp. 465-480 online at JSTOR. Henry Steele Commager, "Leadership in Eighteenth-Century America and Today," Daedalus 90 (Fall 1961): 650-673, reprinted in Henry Steele Commager, Freedom and Order (New York: George Braziller, 1966). Joseph J. Ellis. Founding Brothers: The Revolutionary Generation (New York: Alfred A. Knopf, 2000), winner of the Pulitzer Prize for History. Joanne B. Freeman, Affairs of Honor: National Politics in the New Republic (New Haven: Yale University Press, 2001). Jack P. Greene. "The Social Origins of the American Revolution: An Evaluation and an Interpretation," Political Science Quarterly, Vol. 88, No. 1 (Mar., 1973), pp. 1-22 online in JSTOR. Mark E. Kann; The Gendering of American Politics: Founding Mothers, Founding Fathers, and Political Patriarchy (New York: Frederick Praeger, 1999). Frank Lambert. 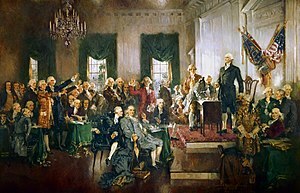 The Founding Fathers and the Place of Religion in America. (Princeton, NJ> Princeton University Press, 2003). Martin, James Kirby. Men in Rebellion: Higher Governmental Leaders and the coming of the American Revolution, (New Brunswick, NJ: Rutgers University Press, 1973; reprint, New York: Free Press, 1976). Morris, Richard B. Seven Who Shaped Our Destiny: The Founding Fathers as Revolutionaries (New York: Harper & Row, 1973). หน้านี้แก้ไขล่าสุดเมื่อวันที่ 16 มีนาคม 2560 เวลา 16:40 น.